In the hospitality industry fake grass can improve the aesthetics of your premises, reduce maintenance costs and create clever garden areas. Despite the UK weather, al-fresco drinking and dining is becoming much more popular. 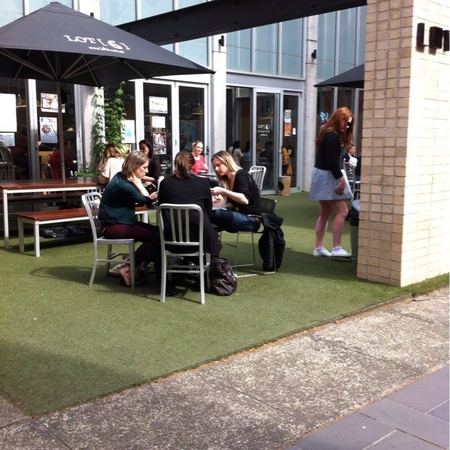 We seem to be mimicking our Continental cousins, with outdoor seating areas popping up in high-streets everywhere. We can assume the smoking ban is also driving behaviour. Cafes and restaurants are spending thousands on developing elegant outside areas. The addition of an artificial grass surface can make a dramatic impact, creating an attractive garden-area for customers to enjoy. If you have a high-street terrace, this is sure to appeal to passers-by. The material is extremely versatile and can be installed on a variety of surfaces. For older buildings with courtyard areas or even back yards, it can simply be laid over the existing concrete. Thus making an attractive area for patrons, that’s soft underfoot. The addition of a few potted plants and hanging baskets can turn tired, concrete spaces into an oasis. This has the potential to transform your business. As well as a decorative feature, fake grass is highly practical. It’s a durable surface for beer gardens and pubs with children’s pay areas. Not only will it look neat and attractive all year round, it’s very easy to maintain. No mowing, watering, muddy patches or scorching and no gardener to pay. The beauty is, after a busy afternoon, the surface can be hygienically hosed down so it’s always immaculate. In hot climes, it’s becoming quite common to paint your grass green? Last year, two thirds of the United States was severely affected by the worst drought in decades. This has led to a huge increase in the popularity of lawn spraying. Grass is Greener Lawn Painting operates out of Staten Island, New York. The company has been featured on CBS, CBC News and the Weather Channel. Their contracting business is booming, alongside this they’ve opened an online store selling equipment, allowing customers to paint their own lawns. Trees and shrubs can be sprayed too. The new craze is rather like something out of Alice in Wonderland – painting the roses red. While it may seem strange, the solution is deemed an environmentally friendly way to reduce maintenance. The paint is organic, non-toxic and actually adds beneficial chemicals to the grass. It’s waterproof, dries in 2-3 hours and will last up to 3 months. LawnLift are producers of America’s best-selling grass paint. They promise the best colour match to natural grass and also offer paints for black and brown bark and mulch. Paint contains a naturally occurring ammonia additive to enhance growth. In the winter months it acts as a protective barrier for increased growth come spring. In the UK, Telford based firm Amenity sell turf colorants to restore sports turf. Will home owners start to catch on too? Paint is a short term solution, unlike artificial grass which will last up to 20 years. While you may save water, you’ve still got to mow and re-spray. Some pet suppliers sell lawn paint for home use to touch-up yellow spots but they’re not meant for large scale application. Tennis clubs are increasingly opting for artificial grass courts. The main reason is the enhanced drainage they provide, allowing practice and play all year round. While other surfaces are prone to water-logging, flooding and algae, the permeability of fake grass means such problems are vastly reduced. Synthetic surfaces are medium to fast paced, providing consistent bounce and good response to all types of spin. They offer excellent traction in all weather conditions, with good comfort underfoot. Courts are suitable for all levels of play. Artificial grass is aesthetically pleasing and often indistinguishable from natural grass, with the benefit of improved durability. Maintenance costs are significantly reduced – no mowing, watering, weed-control or re-seeding. Plus, your tennis shoes stay clean. Tennis is definitely catching up with other sports that embrace 3G pitches. A major safety concern is skin abrasion but modern products are designed to be just as safe as the real thing. Sceptics should take a look at previous post about the first professional UK rugby game played on an artificial pitch. The renovation of old tennis courts is simple and relatively inexpensive too. The material can be installed on an existing sub-base which helps to keep the costs down. Old, contaminated surfaces can be removed, along with moss and algae problems. The featured image is a court Leisure Tech Lawns installed at Westerham in Kent. We have been involved in many tennis projects – a private roof-top court in Jersey and professional courts for a club in Bexley, London. Is the artificial grass greener? Whether artificial grass is greener and more environmentally friendly than natural grass maintenance is a complicated issue. On one hand, fake grass saves water and electricity and eliminates the need to use chemical products. On the other – it’s made from plastic, so how can it be a green choice? How can a plastic product be green? As a plastic-based product, artificial grass is reliant on oil for its production so how can this be a green choice? This debate has been going on for decades. Many studies have been carried out to try to determine which produces more carbon emissions – the maintenance of natural grass or the production of an artificial product. Unfortunately, results are not very conclusive. Fake grass is not natural, so it does not offer the biodiversity of a live lawn. Although, it can also be argued that fertilisers and pesticides create imbalances and kill-off living systems. Synthetic grass supporters also refer to many cases where grass clippings have been blamed for polluting the environment such as the Mississippi River. As grass clippings decay, they release nutrients which upset complex eco-systems, harming plants and wildlife. When grass dies it goes back into the earth and decomposes naturally, whereas plastic ends up as landfill waste. There is no disputing this. However, these days, many artificial grass manufacturers are using recycled materials in production. For instance plastic bottles can be re-used to form the weave and the backing. In areas like California where there are serious water shortages, fake grass tends to be considered the most eco-friendly option. In Las Vegas, the Government actually pays citizens not to water their lawns, by way of a rebate. They calculated that every square foot of grass replaced with an alternative will save an average of 55 gallons of water per year. The EPA in the US have calculated that Americans use 800 million gallons of fuel per year in petrol-powered engines for lawn care. This accounts for 9% of air pollution. A Swedish study found that cutting grass for an hour with a gas lawn mower is about the same as that from a 100 mile car journey. The EU is currently looking at revising laws. Posted in Artificial Lawn Advantages, Fake Grass | Comments Off on Is the artificial grass greener?